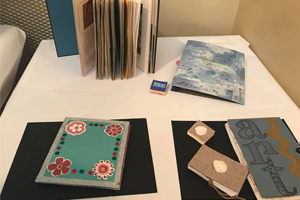 Construct your own sketchbook in class and then fill it with art, quotes, song lyrics & more. Express yourself using ink, watercolor, printmaking, and expressive lettering. Spring semester for this class resumes January 7, 2019 and ends May 20th 2019. At the end of the course students will receive a certificate and there will be an honorary reception to display all the student’s work. MACC Members receive a discount on tuition. Please note there is a one time materials fee in the amount of $50 that goes directly to the instructor the first day of class. Payment can be submitted as cash, credit card, or a check.